Recovering data from a corrupt or inaccessible storage is never an easy task, especially since you never know if you might recover all your data or just part of it. most people just let go and end up loosing precious data that might have been rescued by little or no effort, just by downloading or purchasing a cheap yet powerful program online. Scan drives larger than 2 TB, locate missing partitions, or recover data from formatted drives; Stellar Phoenix Windows Data Recovery will take care of just about everything you need to reclaim your lost data. With faster scan engine, data recovery becomes quick even for the worst-case scenarios. Recover your picture-perfect snapshots and experience the fun once again. Phoenix Data Recovery has you assured of a successful recovery of your lost images and multimedia files, no matter how they got deleted. Make the most of this recovery application by configuring the tool to recover select file types. This software proves to be worthwhile even when you have deleted some volumes on your hard drive. Stellar Windows Data Recovery scans your Windows based media just fine to locate lost or deleted volumes and recover traces of files that were earlier residing on these volumes. Stellar Phoenix Windows Data Recovery adds a layer of flexibility by featuring options to sort out and view files in three different tree-structured lists: Classic List /File List/Masked List. So now, you can choose what you need to recover with a more fine-grained approach. Don't fret after losing your esteemed pictures and video collections on your mobile phones, have the software do it all for you with a minimum effort. Recover everything stored on your smartphone's internal storage or memory card with this exquisite utility on hand. 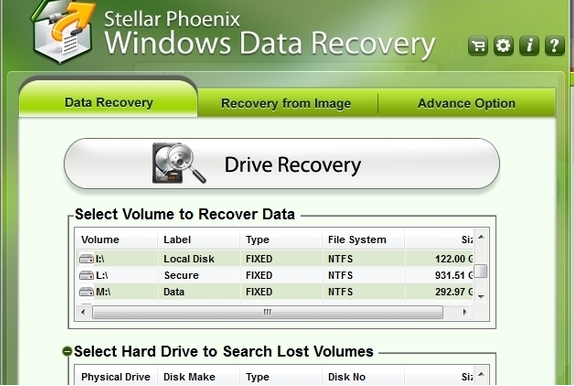 Stellar Phoenix Windows Data Recovery helps you choose the best scanning option that is apt for your data loss case. 'Normal' should be the preferred scan mode for all instances of data loss, while 'Advanced' scan helps to deal with more complex data recoveries. Specify your file name or file type in the 'Search' toolbar to perform criteria-based searching for all desired files in the main interface after scanning. With this feature, you can refrain from crawling through the whole list of scanned items to search necessary files. Generate a new tree-structured list containing only your desired files by specifying a masking criterion under 'Filtered Tree' tab. This feature can be used to trim down the original scanned item list and go for a selective recovery of files to accelerate the recovery process.